Europe will never be the same again. De Gaulle's charismatic influence over France and the world is gone. Who will fill the void in France and Europe now that France's father-figure is no longer at the helm? NO ONE saw large crowds, riots or signs of mass hysteria in Paris on the day President de Gaulle resigned. Vivacious Parisians, this once, awaiting De Gaulle's departure at the Elysee Palace, were calm, orderly, as they waved farewell to their leader. President de Gaulle had told the French people they would have to follow his leadership or reap "chaos" — "me or chaos." They wanted neither. The French are, in fact, rather pleased with themselves that they did not panic when De Gaulle stepped down. France for once remained calm, was not unduly shaken. Frenchmen, of course, have mixed emotions toward De Gaulle's departure from the political scene. They are both relieved and apprehensive — concerned about a future without their towering father-figure to guide them. What future is there for a De Gaulle-less France? What will happen to Franco-American relations? Will there be a thaw — perhaps a honeymoon — in future Washington-Paris relations? Will France now cooperate more closely with her Western allies — especially in NATO? Will the French franc have to be devalued in the near future? How long before an economically powerful West Germany picks up the reins of Common Market leadership from an unstable, vacillating France? Will France soften her attitude toward Israel and lift her ban on arms shipments to that country? Will she now deliver the fifty Mystere supersonic jets which Israel has already paid for, but which De Gaulle refused to deliver? After De Gaulle's resignation, the whole world waited to see who would be the next elected President of France — who, if anyone, could rule that unstable country. De Gaulle cast such a long shadow over France, Europe and the world for so long that any new French President must appear like a dwarf by comparison. Frenchmen, as well as non-Frenchmen, fear that political and economic instability may again return to France — as it was in the pre-De Gaulle days. The burning question in the minds of Britons is this: "Will De Gaulle's departure from the French political scene now enable Britain to get her toe in the door of the Common Market?" Many have asked: "Just what was it that brought about the departure of President de Gaulle?" Frenchmen, it will be remembered, became fed up with sacrificing endlessly in order to build De Gaulle's threefold dream: (1) French military power (her force de frappe), (2) massive gold hoardings and (3) international grandeur. So... in May, 1968, all France erupted in a paroxysm of riots and strikes which brought France to a grinding halt. This widespread resistance to government policies brought De Gaulle virtually down on his knees as he desperately attempted to prevent total chaos and imminent civil war from breaking out in France. Only the army stood in the way of a leftist take-over. De Gaulle was forced to give in to the ten million strikers who urgently demanded higher wages. De Gaulle instructed his Prime Minister, M. Pornpidou, to promise disgruntled Frenchmen a 35 percent increase in the national minimum wage. At that time we reported in The PLAIN TRUTH from Paris: "But this wage increase will have a very serious and crippling long-term effect on the French economy." Even at that time, it was plain to see what was happening to France. De Gaulle was in a dilemma. If he didn't give in to the strikers' demands and grant a big wage increase, all France would soon be paralyzed — bankrupted by the effects of crippling strikes. De Gaulle's Fifth Republic would have crashed under the weight of a full-scale bloody revolution. Nobody in France, it seemed, really wanted that to happen. But if De Gaulle gave in to the demands of the workers and granted the strikers their wage increases, it would be just a matter of time until the French economy would be in the doldrums — and that is just exactly what has now happened! There are important reasons why De Gaulle stepped down from his pinnacle of political power in France. France was tired of following De Gaulle toward the ever-elusive goal of international pride and prestige. Frenchmen were weary of supporting De Gaulle's very costly force de frappe — his independent nuclear striking force — through tax increases. De Gaulle's magic charm was beginning to wear very thin. The average Frenchman was more concerned about a better living standard than he was about French grandeur or how many hundreds of millions' worth of gold the French government had hoarded away — or with De Gaulle's pet project — an independent nuclear deterrent. So... all France spoke out. De Gaulle hesitated, then gave in to the demands of his people — knowing full well that this meant the death-knell to his cherished hopes of restoring France to her place of Big Power status and resultant prestige. Nobody yet really seems to know why De Gaulle forced the issue by thrusting upon the French nation a referendum, thereby bringing about his defeat and humiliating rejection by the voters. Had De Gaulle been misled — wrongly thinking the polls showed he would once again win? Had he misread the Frenchman's mind toward himself and his policies? Or, was he led, compulsively, to reassure himself that the French nation was solidly behind him? Whatever the reasons, De Gaulle gambled and lost! So he gracefully retreated to Eire (Southern Ireland) to vacation until after French elections put a successor in the Elysee Palace which he had occupied for nearly eleven long years! It will take time to alter the course of France as set by De Gaulle. But France is bound to alter her course — is certain to begin veering away — though some form of Gaullism will undoubtedly continue to guide the destiny of France for several years to come. Within the last year France has stumbled from crisis to crisis. Her reserves have slipped from about $6,100,000,000 to $3,800,000,000. The riots and strikes which nearly paralyzed France in 1968 forced the government to grant wage increases which France could ill afford. This has put such strain on the franc that devaluation is almost certain as a therapeutic measure to restore the health of the French economy. Furthermore the Gaullist theory that the Soviet Union was willing to play ball with any nation who would be nice — this theory was shattered by the Soviet military occupation of impotent Czechoslovakia. Even De Gaulle apparently finally awakened to the facts of life — awakened to realize that Russian Communists were determined to maintain their iron grip over all Eastern Europe. Russia's invasion and military occupation of Czechoslovakia shattered once and for all De Gaulle's dream of a Europe "from the Atlantic to the Urals." So, many in France just became fed up with De Gaulle — fed up with his economic and political policies. Even many Frenchmen were annoyed to see their President insulting the rest of Europe, America, Canada, Israel — anyone who opposed him. In spite of De Gaulle's attitude toward just about everyone who disagreed with him, one fact is generally agreed upon. Everyone — friend and foe alike — respected De Gaulle for his unshakable convictions. No one thought he was a weakling. But it is now clear that West Germany is the real economic powerhouse in Western Europe. West Germany also has the most powerful conventional military force in NATO. Even before De Gaulle's resignation, it appeared that French envy and concern over Germany's rising power was beginning to color their attitude toward Britain in her bid to enter the Common Market. Hence De Gaulle tendered to Britain a feeler in which he proposed close Anglo-French cooperation to counterbalance rising German economic and political dominance over Common Market member nations. Britain — Still Knocking on the Door! Since De Gaulle passed from the French political scene, some Britons feel they now have a good chance of getting into the Common Market. But, they don't realize just how many obstacles there are in the way. In May, I was invited to attend the 20th anniversary of the signing of the treaty which brought into being the Council of Europe — an organization formed for the express purpose of fostering technological, political, social, economic and other types of cooperation between member nations. The Council of Europe now has 18 members (there were only 10 founding members) and includes Britain, West Germany, France, Italy, Scandinavia, Greece and other European countries. This special 20th anniversary meeting was held at the Banqueting House in London, near No. 10 Downing Street. It was attended by Her Majesty Queen Elizabeth II and His Royal Highness, Prince Philip, West Germany's Foreign Minister, Willy Brandt, Britain's Prime Minister Harold Wilson, numerous British M.P's., and foreign ministers of the member nations. Her Majesty Queen Elizabeth II gave the welcoming address. She spoke repeatedly of "European unity" and alluded to the British desire to promote European unity by joining the Common Market. The British Prime Minister later spoke, and continually referred to European unity. He made no bones about the British Government's avowed policy of seeking full membership in the Common Market. "The policy of Her Majesty's Government remains firmly based on our application for full membership of the European Communities. Our determination to join the Communities did not weaken in the face of the delay in opening negotiations on our application, over eighteen months ago," said Mr. Wilson. Mr. Willy Brandt also spoke at this anniversary meeting, and he, too, had European unity on his mind. There was still, he said, "no European Peace System" which could guarantee Europe's peace and safety. While in Britain, Mr. Willy Brandt appeared on B.B.C. television to answer a number of questions relative to Britain's improved chances of joining the Common Market — now that De Gaulle is no longer at the helm in France. When asked if West Germany would "veto British entry" into the Common Market, he replied: "No! No!" Mr. Brandt was then asked: "What is the earliest, given the most optimistic prediction, that Britain might become a member of the European Community?" British Entry — Far Away — If At All! Brandt's answer: "Had one started discussions in '67, as I think one should have done, it would have taken two and a half (years) to negotiate. And then one would have had a period of two or three years as a kind of interim period, period of adjustment, before full membership would have taken place." That's almost half a decade. Later, the West German Foreign Minister stated the possibility existed that it might take a little less than three and a half years for Britain to become a full member — from the date when she again would begin negotiations toward full membership. At the Brussels meetings in 1967 — when Britain's second application to join the Common Market was considered and vetoed by France — Mr. Brandt told me it was, he felt, only a matter of time until Britain would be admitted into full membership in the Common Market. Mr. Duncan Sandys, former Conservative Minister of Defense and, at present, the President of the British Council of the European Movement, also recently told me that he believed De Gaulle's removal from the Presidency in France would pave the way for eventual British entry into the Common Market. Mr. Sandys, son-in-law of the late Sir Winston Churchill, is an influential British M.P. It is quite clear from official Government statements that Britain is again fully determined to begin negotiations toward entering the Common Market — in the near future. But there are important reasons why Britain could not be admitted until 1972 or 1973 — even if she began negotiations tomorrow — and if she weren't again blocked by France or some other member of the EEC! For many years now, The PLAIN TRUTH has been saying De Gaulle was the one person preventing the formation of a full-fledged league of European States. De Gaulle's dream of a "Europe from the Atlantic to the Urals" is dead. But a new idea of Europe is soon to emerge. 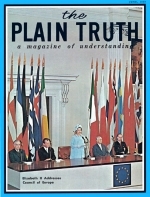 The PLAIN TRUTH magazine and The WORLD TOMORROW broadcast have reported for many years that this new Europe will be dominated by Wert Germany — not by France! It should surely be plain for all to see that Germany is now the Giant of Europe — economically, militarily (so far as conventional weapons are concerned) and industrially. She is even geared to produce nuclear weapons — if she only slightly altered the course of her present energies in the nuclear field. Germany's Finance Minister, Herr Strauss, has said that West Germany cannot remain "a political dwarf" while she is "an economic giant." Remember, also, that the West Germans have steadfastly refused to sign the Nuclear Non-proliferation Treaty. Why? Mr. Strauss says that to sign this treaty would, for the Germans, be "a Versailles of cosmic proportions." But where does France go from here? One thing is certain. France is not going to be able to push her Common Market partners around — as in the past. This is especially true of the Franco-German relationship from now on. The West Germans know they are now seated firmly in the economic saddle of Europe. They do not intend to let France, Britain, the U.S. or anyone dictate to them how they are going to manage their economic affairs! They ask: "Why should we Germans have to pay for the economic folly of other nations — even if they are our allies?" "Why should we sacrifice while others fritter away their economic advantages in paralyzing strikes, industrial mismanagement, pleasure-spending sprees, — and live totally beyond their means?" Many can now see the handwriting on the wall of France. Political instability and economic disaster lie dead ahead — unless someone can take hold of the French helm of state and the French mind and change course — immediately! We need to remember that, before De Gaulle's presidency in France, French governments usually lasted only a matter of months — 26 successive governments rose — then fell — between 1945 and 1958! When De Gaulle assumed power in 1958, order and stability were established in that unstable country. Now that he is gone, political and economic instability again stalk that nation. In the ensuing economic chaos and instability, West Germany will be sure to benefit — economically and politically. The nations of Europe will be forced to accept West Germany as the primary bulwark of strength and stability. The United-States-of-Europe movement will soon gain momentum, now that De Gaulle is gone. Germany will play the dominant role in this movement! Britain will fall further behind Germany. For economic reasons, she will probably never attain full membership in the Common Market. But if she should finally gain partial membership in the EEC, she will NOT long continue as a member. Rather, she will later become an economic and military target of a powerful union of European States — and so will the United States! Regardless of whoever is at the helm of France's government from now on, you will see more chaos and instability! She will stumble from one crisis to another — playing a subordinate role to Germany! This is absolutely certain. You will not have long to wait. Watch France! Also, watch Western Germany! World-shaking events are unfolding right now before your very eyes. These important events were foretold in advance news reports in your Bible thousands of years ago. They will come to pass exactly as predicted! If you wish to know more about the future of nations such as Britain, the United States and France, then read our free book entitled The United States and the British Commonwealth in Prophecy.